Honestly, if you don't have ESPY fever, we don't know what's wrong with you. People have often commended ESPN for running the ESPYs during the All-Star Break, and we agree, though for likely different reasons: We, like you, find ourselves so into sports sometimes that it's helpful to have an event that makes us want to keep a considerable distance from sports for a while. We're not going to get into the plethora of reasons the ESPYs make us want to die — though you surely know most of them and are probably exhausted just thinking about them — we would like to point to the strangest ESPY category they've had in a while: Th Hummer Like No One Else Award. That's really what it's called. 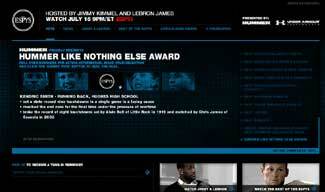 We doubt whether or not LeBron James would want to win this one ... and of all the categories to nominate a WNBA player!